The battle between Donald Trump and Fox News is back with a vengeance. Fox wants the famously non-apologetic presidential candidate to apologize for his latest round of attacks against Megyn Kelly. 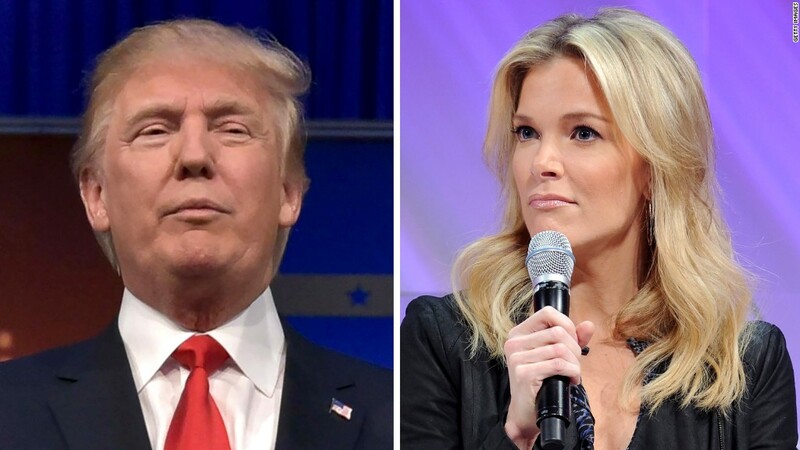 "Donald Trump's surprise and unprovoked attack on Megyn Kelly during her show last night is as unacceptable as it is disturbing," Fox News chairman Roger Ailes said Tuesday afternoon. He added, "Donald Trump rarely apologizes, although in this case, he should." Trump almost instantly responded -- not with an apology but with a fresh shot at Kelly. And during a news conference Tuesday evening he dismissed Kelly. "I don't care about Megyn Kelly," he said during a news conference. "She should probably apologize to me, but I just don't care." Trump has been furious with the 9 p.m. host ever since she questioned him at Fox's GOP debate on August 6. In a new storm of tweets on Monday night, Trump said Kelly -- back from a 10 day vacation -- was "off her game" and suggested she should be replaced. He retweeted people who called her a "bimbo" and "a waste." Ailes was infuriated. In a statement Tuesday he assailed Trump's "verbal assaults," praised Kelly's journalistic chops and said "all of us at Fox News Channel reject the crude and irresponsible attempts to suggest otherwise." "I fully support her as she continues to ask the probing and challenging questions that all presidential candidates may find difficult to answer," he said. Within an hour Trump had put out his own statement. "I totally disagree with the Fox statement," he said. "I do not think Megyn Kelly is a quality journalist. I think her questioning of me, despite all of the polls saying I won the debate, was very unfair. Hopefully in the future I will be proven wrong and she will be able to elevate her standards to a level of professionalism that a network such as Fox deserves." In a final tweak, Trump added, "I will be in Iowa tonight with my speech being broadcast live on CNN and other networks." Will he appear on Fox again this week, given his renewed criticism of Kelly? The network is not currently promoting any upcoming appearances. The candidate recoiled at Kelly's tough questioning at Fox's debate when she pressed him on crude comments he had made about women, and he has been complaining about her pretty much ever since. For Fox, the situation has been exceedingly delicate. Ailes views Kelly as the network's biggest star -- particularly looking ahead to the coming years -- but also knows Trump is an important news story, a highly influential figure and a ratings magnet. Ailes tried to broker a truce with Trump on August 10, but it didn't last long. Ailes is now fed up with Trump's "disgraceful" behavior, according to a person close to Ailes. Fox personalities by and large refrained from talking about Trump's earlier attacks against Kelly. But on Monday they were given the thumbs-up to defend her. Trump is "totally out of control" and his Twitter attacks are "totally unwarranted," Kelly's colleague Brian Kilmeade said on "Fox & Friends" Tuesday morning. Jedediah Bila, a rotating host of the 12 p.m. talk show "Outnumbered," called Trump's comments about Kelly "childish and in poor taste." Anchor Bret Baier, who moderated the debate alongside Kelly, tweeted that Trump "has made his feelings clear. But THIS needs to stop." Bill Hemmer, a morning news anchor on Fox, flagged the "bimbo" retweet and wrote, "Easy, Mr. Trump." Geraldo Rivera also weighed in, writing, "Wish pal @realDonaldTrump would cool feud with @megynkelly Point is made boss. Now world needs you to use bully pulpit to address big issues." And Dana Perino, co-host of "The Five," wrote, "The intelligence, class & grace of Megyn Kelly shined last night after her week's vacation with her family." Kelly has sought to take the high road. While some Trump supporters have pilloried her on social networking sites, her ratings haven't been dented by the controversy. If anything, her debate performance and the ensuing controversy has lifted her profile and her ratings. When Kelly went on vacation one week after the debate, Trump bought into the conspiracy theory that had circulated among his supporters that she'd been sidelined as a sort of punishment for her debate performance. In fact, Kelly's vacation was scheduled well ahead of time, and Fox News called it "bizarre" that Trump would think otherwise. On Monday, Kelly returned and Trump was watching. Before her 9 p.m. hour was over, he tweeted that "I liked The Kelly File much better without Megyn Kelly. Perhaps she could take another eleven day unscheduled vacation!" Trump had appeared on another Fox News program, "The O'Reilly Factor," earlier in the evening. Kilmeade seemingly went out of his way to defend Kelly on Tuesday morning, bringing up Trump's Twitter rant after covering Trump and Jeb Bush's latest squabble. Trump is a frequent guest on "Fox & Friends," and Kilmeade called him a "friend," but had a sharply worded message for him. "He is totally out of bounds reigniting that fight," Kilmeade said. "I don't know if he expects to get ratings out of that, or poll numbers, but he's not going to be successful." He also said, "You can not, you should not, keep going after her." The Fox hosts rallied around Kelly a day after Rupert Murdoch, whose media conglomerate owns Fox News, urged former New York City mayor Michael Bloomberg to run for president in response to Trump becoming a "very serious candidate."